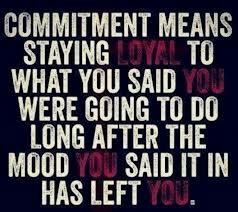 The biggest commitment you must keep is the commitment you keep to yourself. 2) We fear hearing it from other people, especially people who are closest to us – and who we fear losing or making feel uncomfortable if we want to change and transform into a better version of ourselves. I read recently that one of the top 6 fears that people have against succeeding in their lives/work is the fear they have of losing love. How true that fear is - because most of the time we don’t realize that we’re not stepping out because we don’t to make others feel uncomfortable around us. Maybe it’s our parents who we don’t want to out-succeed. Or maybe it’s an older sibling, or maybe it’s even our spouse - who, for whatever reason, hasn’t claimed their success. This is the stuff that doesn’t get talked about much. And maybe it doesn’t get talked about much because most people aren’t aware of what they’re not aware of. Most of the time the hold backs we face are things that we aren't even aware of. And when we aren't aware we can't change it - especially if we're more committed to something else than what we say we want. For example, say we have a Big Vision – we know what we want, we know why we want it, we have the images glued to our vision board, we can see it, feel it and almost taste it, yet it continues to elude us. An underlying commitment. See, we're always committed to something – but most of the time we don’t realize that we're more committed to something very different than what we say we want. For example, if we say we want to step-out and claim our vision, we want to shine, we want to write, teach, speak, sing, get in shape, whatever – yet we aren’t taking the necessary action to manifest that vision and it continues to elude us – I can only guess that we’re hovering over an underlying commitment. Maybe we’re more committed to staying comfortable, not being seen, and making other people in our life feel more comfortable around us – so we won’t be criticized and we can keep love - hmm - something to think about huh? Deep stuff but critical stuff if we really want to get into action. Once we can dig up the beliefs, bring them into the light, things transform, we transform, and that vision begins to come closer and closer. You know we’re here for a higher purpose – and others just need to accept that – including us! To delve into this a bit deeper, check-out the Worthy Work here.